PSYCHEDELIC VILLAGE – FULL LINE UP ANNOUNCED! Expanding on this we bring into the fold not only two other stages but a wealth of traders, healers, freaks and crazy colourful characters from around the globe forming the heart of international psychedelic culture. Over the last 7 years Ozora Festival in Hungary became THE psychedelic festival on the planet. It was conceived, organised and built by a team led by a man named Balazs from 2005 until last year. We’ve always had a strong relationship with him and this year are delighted to have him and his team co-produce the village with us and TOGETHER WITH Nano Records, who this year will be CELEBRATING their 10-year birthday party at Glade. There’s a lot of love, experience and magic being thrown at this. So… with the Origin stage, the return of the beloved LIQUID STAGE (set outdoors, in the woods and playing well beyond sunrise!!!) and Inspiral laying down the beats in all their beautiful form, the Psychedelic Village is the festival within the festival. The line up is not YET complete and we still have some really exciting acts to confirm but as you can already see, the plethora of musicians playing across the village means we’re going to be absolutely rocking. 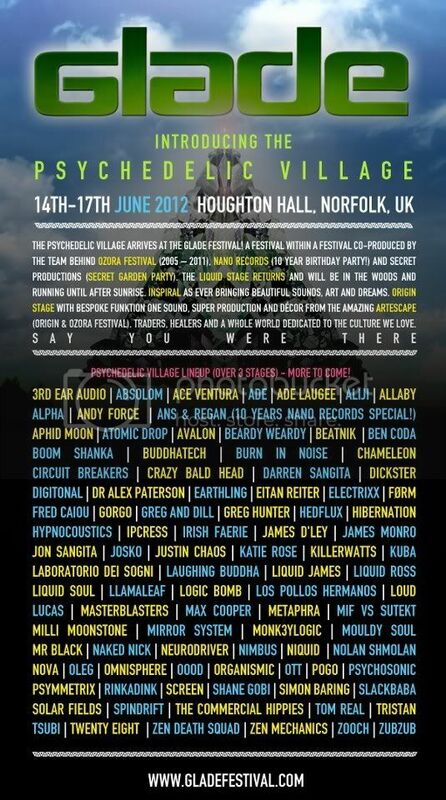 The UK’s most diverse and creatively delivered electronic music event, Glade returns with a bang in 2012. Having endured several well documented venue changes in 2011, the owners of Houghton Hall in Norfolk were so blown away by last year’s event they have thrown open their land and welcomed the festival back. This year Glade will be a much bigger and better event, set to take place over four beautiful days in spectacular English countryside. With an incredible site and a stellar lineup, consisting of hundreds of DJs and live acts from around the globe, Glade 2012 is set to become the must-go-to festival for all lovers of underground electronic music. As anyone who attended in 2011 will agree, this unique venue (which has not been used for any other music festival) is without a doubt the perfect new home for Glade. With a world-class line up of the most exciting names in electronic music alongside the award-winning Secret Productions team (promoter of the year in the 2011 Festival Awards) taking care of the production, Glade 2012 is back to show every other UK dance festival how it’s done. OTHER ARENAS LINES UP TO BE ANNOUNCED VERY SOON! OVERKILL, BETA, METEOR, BASSMENT, THE RABBIT HOLE + MORE!